Grand Hyatt Seoul presents a special Lunar New Year Package and a variety of Lunar New Year hampers in celebration of New Year's. Planning on being in Seoul during the holidays? Then why not try the Lunar New Year Package at Grand Hyatt Seoul, especially designed for those who can't make it home for the holidays, all for a wonderfully affordable price? The Package offers one night's deluxe accommodation, complimentary Ice Rink admission and skate rental for two, free shuttle bus service to Namsangol Traditional Folk Village, complimentary use of the indoor swimming pool, gym and more. The package price is KRW 140,000, exclusive of tax and service charge. It's a great way to spend the holidays and enjoy some quality relaxation time. — Late check out until 3 p.m.
Also, stop in at the Deli where you'll find all kinds of Lunar New Year gift hamper sets to suit every budget, filled with wines, cookies, chocolates, sauces, oils, vinegars, jams, teas, coffees and more. You can choose from our prepared hampers or design your own personalized gift basket by selecting items from the Deli's well-stocked pantry, making your gift even more meaningful. 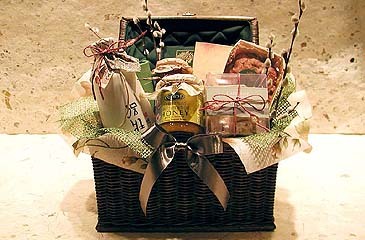 The price for hampers range from KRW180,000 to KRW400,000 exclusive of 10% tax and are available until Feb 19.